First... the good news. Vanilla Almond Special K tastes good. The new flavors amount to sweetness more than anything. While the vanilla offers a notable aroma to the cereal, the taste of vanilla is as subtle as a 1999 Bel Logo Chardonnay. The flakes maintain a fairly decent crunch nearly five minutes after being submerged in milk. Now the bad news -- depending on your daily food intake. Those of you on a "Special K Diet" take note. The new cereal has a signifiacntly lower vitamin and nutrient offering than traditional Special K. The new variety has 35% of vitamin B6, vitamin B12 and folic acid, whereas the original offers 100% of those nutrients. If your eye is on the fat content, the news is still good. A single serving of the new cereal has only 2 grams of fat and zero saturated fat. Mind you, they expect you to get 13 servings out of a 14 ounce box as if we were all very tiny people eating out of thimbles and sleeping in matchboxes. Overall, Vanilla Almond Special K is very good... not fantastic... just very good. 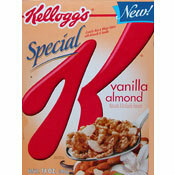 What do you think of Vanilla Almond Special K? It's a little too sweet for me but other than that it tastes pretty good. Worth the buy. I'm not a cereal person at all, especially not Special K, but this cereal is delicious! I'm hooked! Less almonds in this new box. Nice job cheapening out. Now I'll stop buying it! Best cereal ever!! I eat it everyday! :) Yummmm! Really good cereal. Try it if you haven't yet. Great Cereal, but also very sweet. The taste is horrible. I don't know if it's the vanilla flavor or the almonds. Disappointed. I love it!! The only downfall is that if you want your strawberries to soften up the rest of your cereal has to become soggy too, so if you're anti soggy (like me) you'll be eating the strawberries dry, which is pretty weird. But ignoring the strawberry issue, this cereal is pretty darn good! It makes the best afternoon snack at work. Put some in a small zip lock bag and munch away... instead of buying snacks out of the vending machine that are more fattening and expensive. 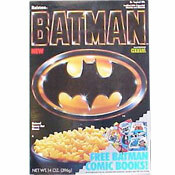 I used to love this cereal. I love the almonds as well as the vanilla taste, but the last few boxes I purchased, the almonds seem to becoming less and less, so Special K manufacturers, please put back my almonds. Use to get 2 or three in every bit, now, I'm lucky 10 almonds in a box. This seriously has to be the BEST Cereal EVERRRRR. OMG it's so good. LOVE IT!! I keep running out and its the only Special K I'll eat!! Try it! They sell it at Wal-mart. THE BEST CEREAL EVERRRRRRRRRRRRR. I WANT SOME NOW! MMMMMMM! I like the subtle vanilla flavoring, but I prefer the fruit versions. Its disappointing that they reduced the nutrient content and increased the fat content compared to the other Special K cereals. I love it. It's the only Special K cereal that I'll eat. It's incredible! I really like this cereal - esp when I want a late night snack or a light meal after work. Prolem is that I can no longer find it in the local grocery markets. By far my favorite Special K variation. Great with Vanilla Silk Soymilk. The Vanilla Special K bars are excellent too! Alright, but the berry version to me tastes better.